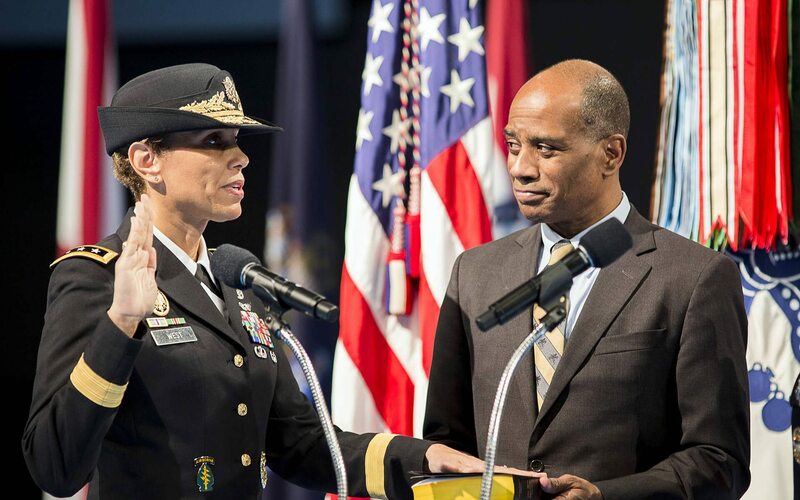 After a U.S. Senate confirmation on Dec. 9, 2015, West became the first African American – man or woman — to be appointed surgeon general of the U.S. Army. The position of surgeon general comes with a third star, making West the first African American female lieutenant general. Her promotion also made her the highest-ranking female graduate of the U.S. Military Academy. Prior to her appointment as Army Surgeon General, West served at the Pentagon as Joint Staff Surgeon, serving as the chief medical advisor to the Chairman of the Joint Chiefs of Staff. She was Army Medicine’s first African American woman to wear two stars. West graduated the U.S. Military Academy with a Bachelor of Science degree in Engineering, and George Washington University School of Medicine with a Doctorate of Medicine degree. She is married to Col. Donald West, USA, Ret., who was a medical task force commander in Afghanistan and Iraq. The couple has two children, daughter Sydney, and son, Logan, a USMA cadet. Among her awards and decorations are the Distinguished Service Medal, the Legion of Merit with three Oak Leaf Clusters, the Defense Meritorious Service Medal, the Army Meritorious Service Medal with two Oak Leaf Clusters, the Army Commendation Medal, the Army Air Assault Badge, and the German Armed Forces Proficiency Badge in Gold. She is a member of the Order of Military Medical Merit and the Order of Saint Christopher and is a Fellow of the American Academy of Dermatology and the American Academy of Family Practice.